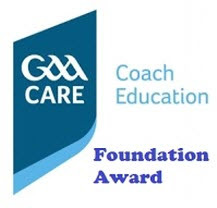 Foundation level coaching course for parents of boys and girls playing football and hurling. The couse runs over two days beginning on Friday 10th Feb in Oola from 7pm to 10pm and Saturday 11th Feb in Doon from 9am to 2pm approx. Contact Richard Bowles, Declan Ryan, Paudie Sweeney, Tom Bourke, or Sinead Burns to book a place.